What made the "Gay '90s" such a lighthearted era? The bicycle! By the 1890s, the bicycle had advanced into a practical means of transportation as well as a popular leisure activity. The Museum exhibits several pre-1900 examples including an all wood riding machine known as a velocipede or "boneshaker." 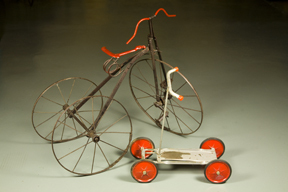 Also on display are High-Wheel bicycles from the 1880s and safety bicycles from the 1890s.